"Highly radioactive" is a somewhat emotional phrase being regularly applied to the debris drawn into the Pacific Ocean after the tsunami of March 2011. Although elements of this disaster have been washing up on the shores of the west coast of North America for quite some time now, recently the first traces of radiation, identified to come from Fukushima, have also been identified along the Oregon shores. You needed to read a long way into the reports to see the levels were fractions of fractions of a percent of the everyday background radiation. Not really something to worry about but it makes a great headline. The debris field is the remnants of millions of tons of the everyday items that made up the towns and villages of the Tohoku coast that was scoured away that day. Whole habitats simply disappeared along with everything they contained. A football crossed the oceans quickly and was emotionally returned to its owner months later. A motorbike, a Hog, kept in a weather-proof plastic garden shed landed in British Columbia and was refurbished and presented to a delighted owner. The wreckage of floating docks, ghost ships, houses and even fishing tanks with live fish still in them (hmmm, I question that one) regularly wash up on the shores of the Pacific countries now. The debris itself set off on its sojourn across the oceans in the days before the meltdown at Fukushima and is generally not considered to be radioactive or pose a risk of wild mutation. What it does carry is the ability to pollute the shorelines when the wreckage comes to rest and potentially this poses an even greater risk is to wildlife. The flotsam carries with it hitchhikers, species native to the waters of Japan but that were not necessarily established elsewhere. 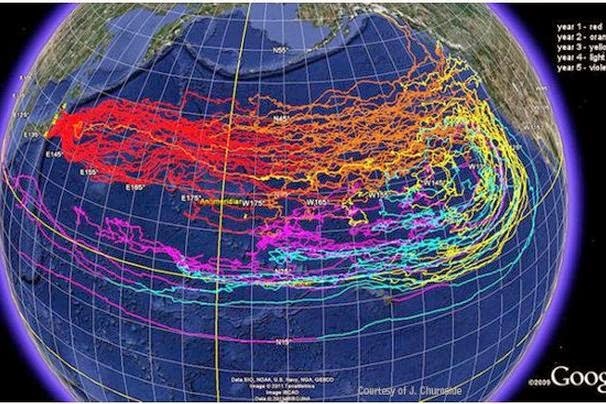 Although the process of ocean current transfer has always existed, this time it is on a scale never seen before. Radiation isn't the problem, fare dodging passengers are. This could be an ocean wide environmental disaster to follow the natural one of 2.42, March 11, 2011. But it just might be forgotten until it's too late.